Power-drifting can yield big fluke. Captain Dave Monti with the 23” fluke caught Saturday while power-drifting , putting the vessel in and out of gear, when fishing the high/low edges at Austin Hollow (an underwater valley) off the west side of Jamestown, RI). Saturday’s wind prediction was off in both intensity and the direction of the wind. Wind and current were not in line. Both of these are needed to establish a good drift for fluke fishing so you drag your bait over the fish. Fluke (or summer flounder) set-up looking into the current for prey that is drifting by. For anglers still wanting to fish for fluke when wind and tide are not in the same direction, one possible solution is to power-drift your boat in the same direction as the current. This involves putting the vessel in and out of gear slowly trying to mimic the strength of the current. This Saturday, anglers Dave Sweet and Craig Picard tried to fish for fluke. Dave said, “Wind and tide made the drift not so great, but we have gotten pretty good at the "power drifting" technique, and it paid off for me today with my personal best eight pound fluke.” I went fluke fishing Saturday as well when wind and current were not in line. So I power-drifted fishing the high/low edges at Austin Hollow an underwater valley off Jamestown and it paid off with a 23” fluke. So when wind and current are not in line and you want to fish for fluke, consider power-drifting. The top five anglers in the West Bay Anglers 2012 William Beaudrey Jr. Memorial Striper Tournament went to Warwick residents. The tournament ran from 12:01 a.m., June 2 to 10:00 a.m., June 10. Prizes were awarded Sunday, June 11th at the Warwick FOP. First place for the overall largest fish (a $500 cash prize) was awarded to Jeff Howard of Warwick who weighed in a 43.85 striped bass he caught off Block Island. Lynne Taylor of Warwick took both female category prizes. She receives $200 for her 31.85 pound bass and $100 for her 28.90 pound striped bass. Male category winners were Kyle Armstrong with a 43.50 pound fish and Chris Levasseur who had a 40.70 pound striped bass. Question: Mr. Monti, I often read your column… I thought you might be able to answer a couple of quick questions. I live in Cranston near the waterfront in Edgewood. During high tide two access points to the bay are occupied by fishermen… they often catch striped bass… Is this fish OK to eat if caught in the upper bay?... I just wonder about the quality of the fish caught in the upper bay. We all know that the shellfish is inedible. What about the fin fish? Scup. Large scup still being caught in the Bay and near coastal waters. Power-drifting can yield big fluke. Captain Dave Monti with the 23” fluke caught Saturday while power-drifting , putting the vessel in and out of gear, when fishing the high/low edges at Austin Hollow (an underwater valley off the west side of Jamestown, RI). Photo by Virginia Magnan-Monti. 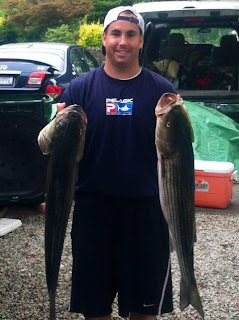 DJ Rubino of Jamestown (in photo) and his brother Brian caught several striped bass late last week off Prudence Island using menhaden chucks. 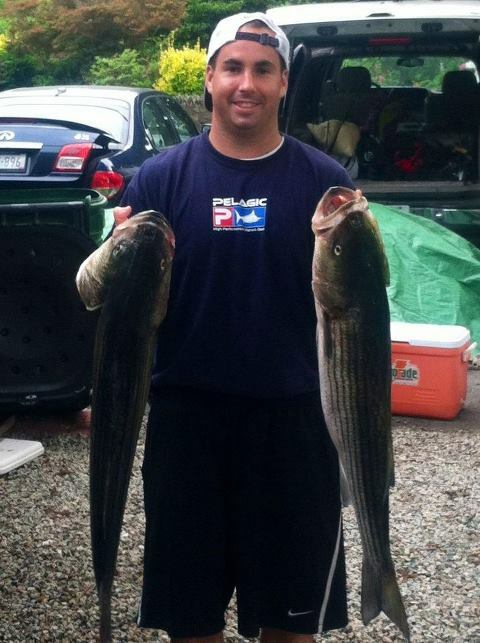 Devin White with 41.4 pound striped bass he caught north of Conimicut Point last week while fishing with his father. 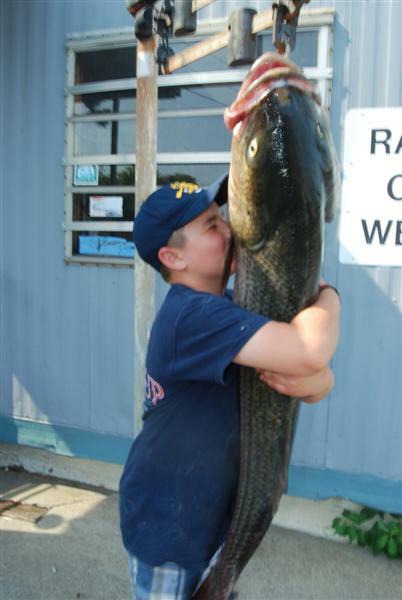 Devon is the grandson of noted author and striped bass expert Captain Jim White of White Ghost Charters. 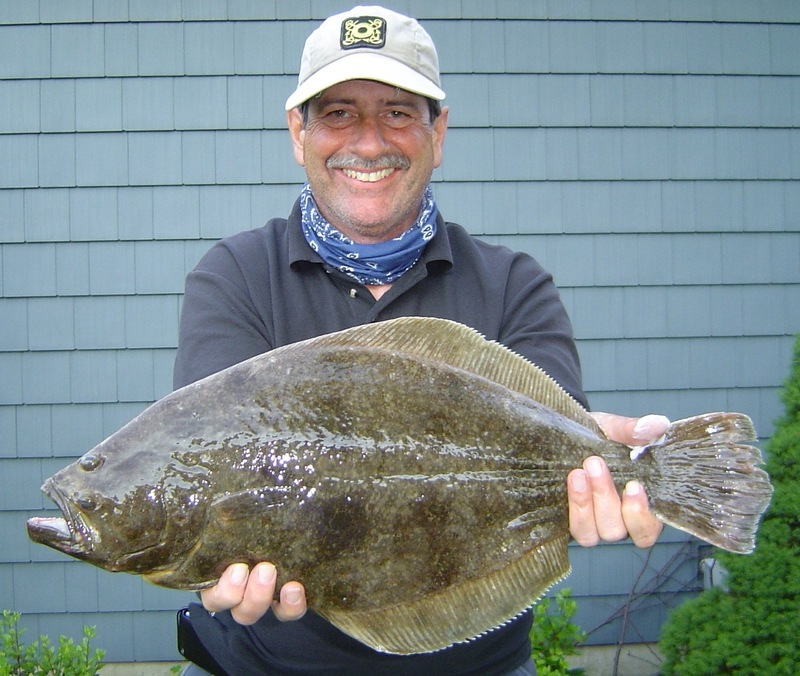 Fluke (or summer) flounder fishing is starting to improve along southern coastal shores off Rhode Island and in the lower part of Narragansett Bay around and south of the Jamestown and Newport Bridges. This year and next year should be good fluke fishing years because according to Jamie McNamee of the Rhode Island Department of Environmental Management’s Marine Fisheries Division 2009 was an outstanding year for new fluke. McNamee said, “The fast growers from this class (2009) of fluke will be growing to 18.5 inches this year and next.” This means we should start to see more legal sized fluke. Fluke is a species regulated by the Atlantic Marine Fisheries Commission and Rhode Island DEM. The minimum size limit is 18.5 inches and this year there has been a liberalization of recreational regulations… anglers are allowed to take eight fish/person/day compared to seven last year. The season runs from May 1 to December 31. Earlier this year I had the honor of interviewing some of the top fluke experts in the state. I asked them for fluke fishing tips we could pass along to readers. The experts included charter fishing guides and Captains Rick Bellavance, Jim White, John Rainone, Robb Roach, Charlie Donilon, Rich Hittinger, George Cioe; several excellent fluke anglers; and bait and tackle shop owners. Here’s what they had to say. • Fish low/high or high/low breaks on the bottom. Fluke like most other fish like structure. The largest fish are often on channel banks, drop offs, etc. So you want to fish these breaks. • Off southern Rhode Island coastal beaches… Watch Hill, Charlestown, in front of the five cottages, etc. The Rhode Island Saltwater Anglers Association’s (RISAA) 15th Annual “Take-A-Kid Fishing Day” is Saturday, June 16, 2012 from 9 to 11:30 a.m. at Brewers Greenwich Bay Marina in Warwick on Masthead Drive. Children are treated to a morning of fishing on the Bay followed by a cookout. Last year over 250 children, 85 member boats and 300 volunteers participated. The purpose of the event is to give seven to thirteen year old children a chance to learn about Narragansett Bay, experience the thrill of catching a fish, and ride on a boat to start building a lifetime of fishing memories. For many children it is the first time they have ever been on a boat. RISAA is looking for volunteers to help with logistics as well as RISAA members that have boats to offer. To volunteer or for more information contact Steve Medeiros at www.stevem@risaa.org . Striped bass fishing remains good but sluggish for some anglers. John Wunner of John’s Bait & Tackle, North Kingstown said, “Striped bass fishing is good with anglers catching them all of the Bay at Prudence Island, far up the Providence River, in Greenwich Bay, off Rose Island, Newport and outside of Allen’s Harbor in North Kingstown.“ Matt Conti of Snug Harbor Marina said, “There are a lot of sand eels at Block Island but the fish are still fairly small in the 28” to 30” range.” Several anglers fishing north of Conimicut Light to Providence I-195 bridge report catching large fish and others report slow action with just a few bites. Kayak angler Bob Oberg landed a 25 pound, 38” bass in seven feet of water in the upper part of the Providence River. As reported last week, ten year old Devon White, while fishing with his father, landed a 41.4 pound stipend bass. Ken Landry of Ray’s Bait & Tackle, Warwick where the fish was weighed in said, “The bass hit when he was retrieving a menhaden he had just snagged. The fish was caught north of Conimicut Point early last week.” Devon is the grandson of noted striped bass angler and author Captain Jim White of White Ghost Charters. Scup. Ken Landry of Ray’s Bait & Tackle said, “Customers are catching large scup both at Ohio Ledge and off the town dock in Jamestown.” John Littlefield of Archie’s Bait & Tackle said his customers are experiencing a good scup bite off Colt State Park, Bristol and at Ohio Ledge.